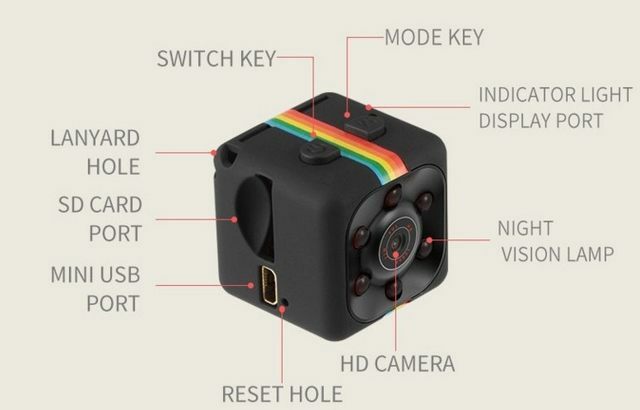 ANTI-THEFT CAMERA: The portable mini hidden camera comes in a mini size(0.8 in cube). It's super convenient to take photos or videos without any attention, which makes it perfect as a home security camera or a housekeeper/nanny cam for recording both snapshot picture and videos. MOTION DETECTION: Intelligent motion activation, the hidden camera will start recording when detecting a movement. 1080P and 720P - two modes for motion detection video. HIGH CAPACITY: Built in rechargeable lithium battery supports up to 30-100 minutes of video recording. Battery capacity: 200mAh, 2-3 hours to fully charge over USB. Please charge the mini camera and insert the card before you use it. If the camera does not work,please reset the camera and try it again. The mini camera will become warm during the operation, because this camera is a HD camera, the warm can be borne, so please make sure that you notice this and then place the order. If you have any question about it ,please feel free to contact us and we will help you solve it ASAP!